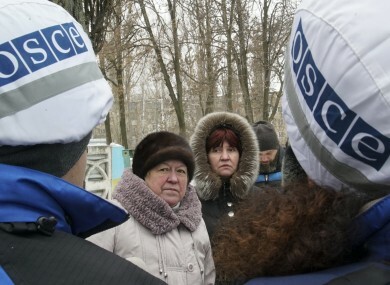 Local residents speak with OSCE monitors in Avdiivka, eastern Ukraine, yesterday. US PRESIDENT DONALD Trump was to hold his first talks with Ukraine’s leader today as a surge in fighting killed dozens and refocused global attention on bloodshed in the EU’s backyard. The phone conversation comes with the death toll at 35 following a week of clashes between Ukrainian troops and Russian-backed insurgents in a level of violence unseen in the eastern Ukraine war zone since 2015. The separatist militias underscored the intensity of the fighting in saying that the Ukrainian army had opened fire against their positions nearly 15,000 times in the past week. Ukrainian President Petro Poroshenko will try to use the call to win assurances of Washington’s continued diplomatic and non-lethal military support that came under former president Barack Obama’s administration. It also follows Trump’s phone conversation with Putin on 28 January that both sides described as constructive. The rebels along with Russia and Ukraine on Wednesday signed up to calls for a ceasefire and the withdrawal of heavy weapons from the flashpoint town of Avdiivka by tomorrow. But the demand for the shooting to stop has not halted the violence and so far there is little sign of the big guns being pulled back around the Kiev-held industrial town of 25,000 at the centre of the fighting. Overnight and early Saturday in Avdiivka passed with relative calm compared with previous days. But the Ukrainian army said one of its soldiers had been killed in the area. Kiev military spokesman Oleksandr Motuzyanyk said the separatists “had pulled their tanks up to” Avdiivka this afternoon in apparent preparation for another battle. A rebel military commander was also killed in a car bombing in what appeared to have been an internal dispute over power and unrelated to the ongoing violence. Most residents of this blue-collar town work in a major coke plant that has been heavily damaged by the shelling. Avdiivka remained without electricity on Saturday and with only sporadic power supplies to heat homes against freezing temperatures and limited supplies of water. The giant plant provides electricity for much of the region and has been the target of previous deadly rebel attacks. Plant spokesman Dmytro Murashko told AFP that work brigades tried and failed again Saturday for the second day running to repair broken power lines after shelling halted their earlier efforts. Friday was one of the bloodiest days with nine civilians killed — two of them inside the town. The call to withdraw heavy weapons was made under the coordination of mediators from the Organisation for Security and Cooperation in Europe (OSCE). The Minsk deal was signed in February 2015 and defined a step-by-step solution to one of Europe’s bloodiest conflicts since the 1990s Balkans wars. It has since been repeatedly broken – prompting Wednesday’s meeting of negotiators to call for the warring sides to ensure “strict adherence to (a) full and comprehensive cessation of fire”. The 33-month conflict began shortly after Ukraine ousted its Russian-backed leader in February 2014. Moscow responded by annexing Ukraine’s Crimean peninsula in March 2014 before allegedly plotting the eastern insurgency to keep Ukraine under its thumb. Washington’s UN ambassador Nikki Haley on Thursday condemned Russia’s “aggressive actions” in Ukraine – a surprising attack given Trump’s supportive stance towards Putin. Russia denies any responsibility for the conflict and blames the United States for igniting three months of massive street protests that turned Ukraine toward the West. Email “Ukraine conflict: 35 killed in worst fighting since 2015 ”. Feedback on “Ukraine conflict: 35 killed in worst fighting since 2015 ”.